Looking north and east over the Mott section of Garden City with views of East Garden City, Carle Place and Westbury. Identify the structures associated with the Long Island Motor Parkway and the Vanderbilt CuP Races. What other landmarks can be seen in this aerial? 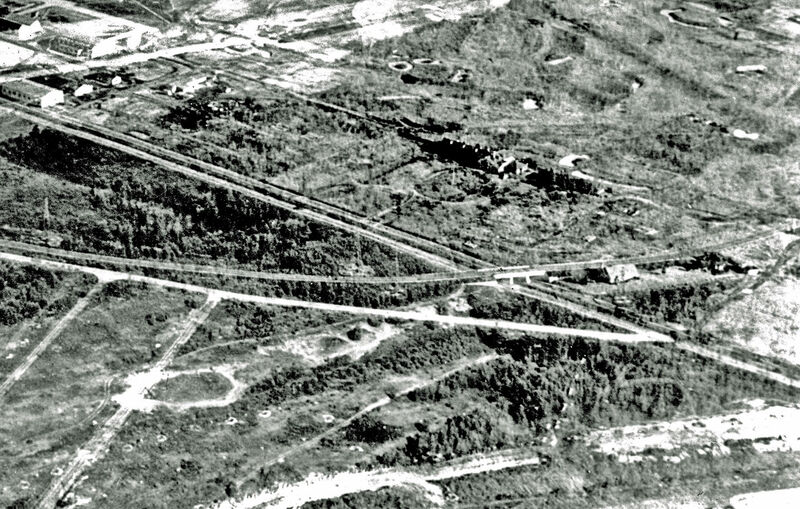 The date on the original aerial image is illegible. Based on the presence of Roosevelt Raceway and the level of Garden City residential development, the best guess for the aerial is 1936-1938. Congrats to Joe Oesterle, Dave Kilkenny, Michael LaBarbera, Tim Ivers, Brian McCarthy, Frank Femenias (see below Femenias' Findings), Bill Bellmer, Steve Lucas, Greg O., Art Kleiner, an.d Frank Mendyk for correctly identifying the location. Kudos to Michael LaBarbera, Tim Ivers, Brian McCarthy, Greg O. and Frank Mendyk for guessing the approxiamte date of the aerial. Current day Roosevelt Field Mall. Looking East. We can see the Clinton Ave bridge, the LIMP Managers house, the Garden City Lodge, and the Mayan Ruins. If the lens was just a smidge wider we may have even had a picture of the LIMP passing under Old Country Rd. As for the year, I am unsure. But the Clinton bridge is still there. Yes some of the Garden City area is already being gridded out. Carle Place looks like a little prairie town. If anyone can help? What is the building just north of the LIMP on the east side of Clinton? This is above the Mott section of Garden City looking NE . 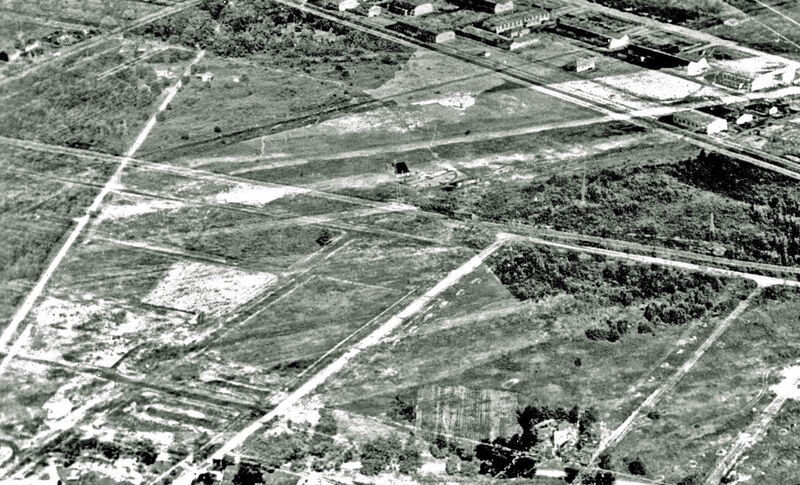 This is Roosevelt Field mostly likely in 1930-1932 before the Meadowbrook was built. You can see the Clinton Ave bridge, the Tool house and the Admin House - as well as the bridge to nowhere. Very amazing photo ! We are looking northeast from Garden City across to Westbury, sometime around the mid to late 1930s. 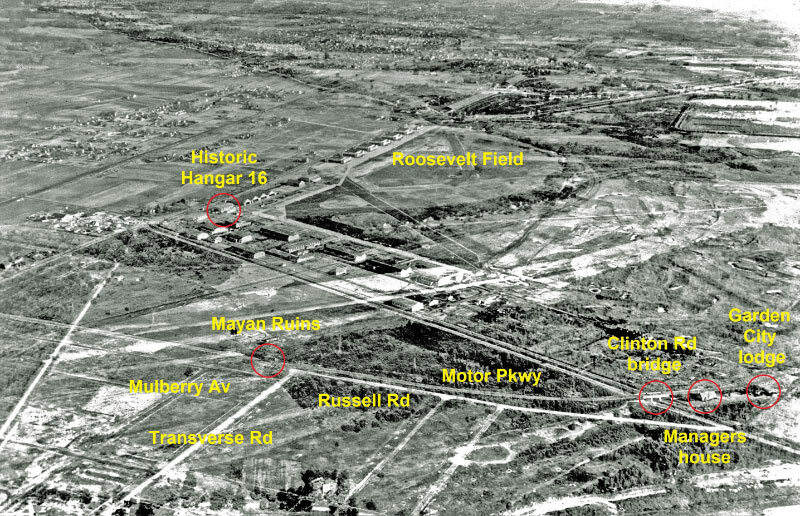 The lower left shows the Clinton Road Bridge, torn down soon after the parkway closed in 1938, and the Mayan Ruins just north of that, roads there are in place with no homes built yet. The office and Toll Lodge on Vanderbilt place are visible. Toward the middle is the 1936 track at Roosevelt Raceway and the Polo Fields on the right. Also upper middle left side is Ellison Avenue LIRR Bridge where old #16 went airborne in 1908 Cup Race (too many stop signs to try that today). Waaay too many things to mention for this photo. Good Stuff !!! BTW Howard, did they tear down the big old house next to the Westbury Hairpin Turn at Wheatley Road ? I passed it last week and noticed it wasn;t there. Looking northeast over the Garden City-Weatbuey area about 1938….the bridge is still standing Clinton) and there’s lack of any development on either side of the LIMP. The Clinton Road bridge visible at the lower right, with the Garden City toll lodge to its right. The “Mayan Ruins” appear in the bottom center. At the top center are the Roosevelt Field hangars and runways. At the top right the rectangular Meadow Brook polo field. A bit grainy, but I like the view! *Location/Orientation: Bird’s Eye View of Garden City, Northeast. *Structures associated with LIMP & VCR’s: LIMP, from right to left….Garden City Toll Lodge, General Manager’s House, Clinton Rd LIMP Bridge, and Mayan Ruins ( undisturbed/intact ). VCR’s….1908 ( Ellison Rd., tough to make out; but it’s east and north of Roosevelt Raceway. 1909,10 ( Ditto for Ellison Rd. But Old Country Rd. is quite visible. 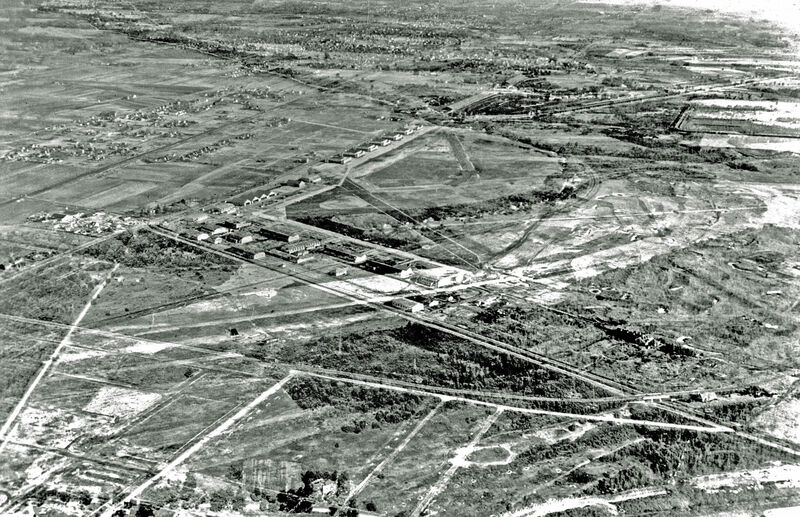 1936,37,60 ( Roosevelt Raceway, tough to make out; but I know it’s northeast of the Meadowbrook Polo Field ). *Other Landmarks: Westbury Golf Club, Roosevelt Field, Meadowbrook Polo Field, and Roosevelt Raceway ( again, hard to make out ). *Year of Aerial/Rationale: I recall images of this area around 1930 on your site here, Howard. They are much clearer than this one. There looks to be more trees,growth etc. in this image, but the parkway bridge over Clinton Rd. is still intact. Let’s say this is 1938. Photo of Mitchell Field (you can see the runway and hangers). I believe they are the newer hangers so this was taken probably after 1931. You can see the Motor Parkway in the upper part of the photo as well. Photographer is airborne over Garden City’s Mott Section, snapping at Roosevelt Air Field at center in East Garden City/Carle Place, looking NE. Wow, love all the open spaces north of Old Country Rd. Houses to fill this area coming soon! Looks like Roosevelt Field hangars are all intact including historic Hangar 16, where Charles Lindbergh’s Spirit of St. Louis was housed for the first cross Atlantic flight to Paris in 1927. This photo was taken before the demolition of Hangar 16 in 1956 and after Curtiss Field hangars of 1926. Need more time to zero in on year. Facing NE toward Roosevelt Field, with Clinton Rd. bridge at lower right. But the problem with the photo is that it’s a double exposure, with other non-existent “roads” superimposed. The photo was taken from a position over Garden City looking northeast toward Carle Place and Westbury. Among the structures associated with the LIMP are the Parkway itself, running from left right in the bottom third of the photo, the Clinton Road bridge, general manager’s office, and “Mayan Ruins” bridge abutments. In addition, the future sites of the 1936, 1937, and 1960 Vanderbilt Cup Races can also be seen. Other landmarks include Roosevelt / Curtiss Field (site of Lindbergh’s famous take-off) with their associated hangars along Clinton Road and Old Country Road, and possibly the Meadowbrook Polo Field. I believe the date of the photo is some time between April and July of 1911 since the Garden City Lodge appears to be under construction. Looking East (and slightly North) at Roosevelt Field. -Identify the structures associated with the Long Island Motor Parkway and the Vanderbilt Cup Races. Motor Parkway front and center with the Mayan ruins almost dead center. Clinton Rd bridge, Manager’s office and Garden City Lodge in the lower right. Grandstands and course for the 1936/37 Cup Races in the distance. -What other landmarks can be seen in this aerial? -What year was this aerial taken? Provide a rationale. Not much time this weekend. Looking northeast over Garden City, Roosevelt Field area. Motor Parkway bridge over Clinton, Garden City toll lodge, Parkway manager’s office. The photo was taken facing N/W from over Garden City looking towards Carle Place, Westbury , and Roosevelt air field. The LIMP structures observe in the photo are The Clinton Ave Bridge, the general manager’s office, the Vanderbilt Cup races track and complex, and the Myain ruins bridge abutments. 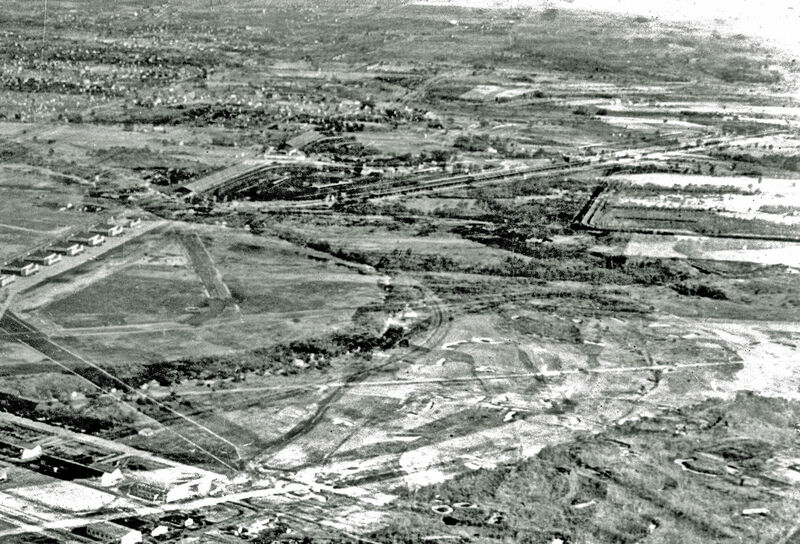 Roosevelt air field (Curtiss field) and hangers, and runways can be seen in the photo. Also you can see the Old Westbury Cub golf course, Meadowbrook Club Polo fields, and the LIRR main line. I would say the photo was taken in 1936 possibly 1937. I compared the aerial photo take in 1933 and 1938 to make this determination. 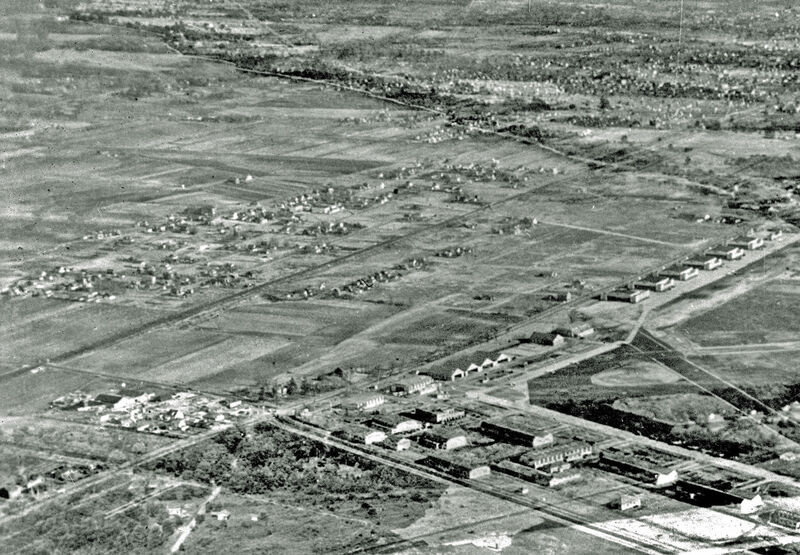 The 1938 photo did have development in Garden City west of Clinton Ave. The 1933 photo not have any development. It looks like the cup course was just completed. Joe Oesterle…... If your wondering about the building ( steep roof ) that’s just a rock’s throw N/E of the Mayan Ruins, so was I. There’s that 1/2 circle landscape design next to it. Makes me think that helicopters or small planes may have landed there? I look around the site here for other images of this area. I believe this is the clubhouse for the Old Westbury Golf Club. Joe Oesterle…..OK Part 2. The building that’s just N/O the LIMP ( vicinity of Lodge, Manager’s Office ) and E/O Clinton Rd is the Clubhouse ( Old Westbury Golf Club ). My mind is fixed on the odd looking house just N/E of the Mayan Ruins. And now I’m fixed on going to bed.